There are some glass-finishing processes which apply to Millersburg Glass. Both Marie McGee’s book and a statement from the late Frank M. Fenton delve into that subject: LUSTRED ware—a kind of iridescent glass not made by spraying hot glass. Little is known surrounding its history during the years of Millersburg glassmaking. 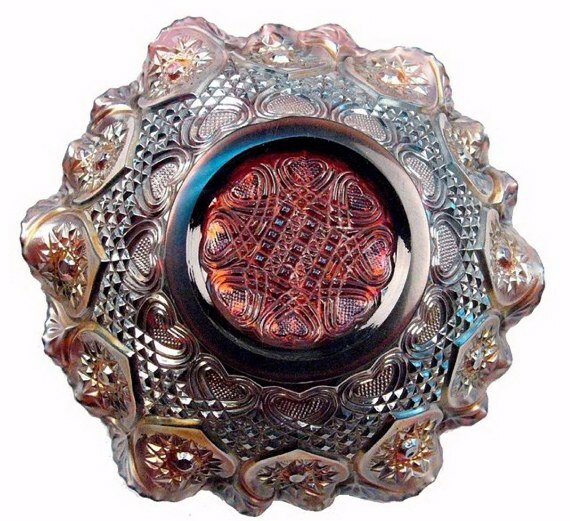 Lustred ware is a type of hand-decorated glass, produced by using a brush to apply metallic salt solutions to glass which has been annealed and cooled to room temperature. The glass is then placed into a decorating lehr, and the heat therein results in an iridescent effect much like glassware which has been sprayed while hot. This method was probably tried at Millersburg and found to be more labor-intensive (and more expensive) than spraying hot glass. 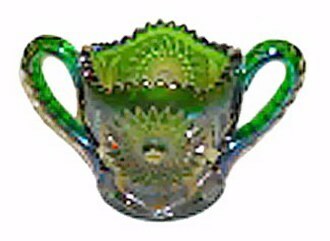 That spraying method might also have produced more desirable iridescent effects, such as the Millersburg Radium ware, than could be had with lustred ware. QUESTION: Do you think it possible that some of these “experimental” pieces found their way into the stream of production? Why do some radium-type examples display a finish having a two-shade effect? 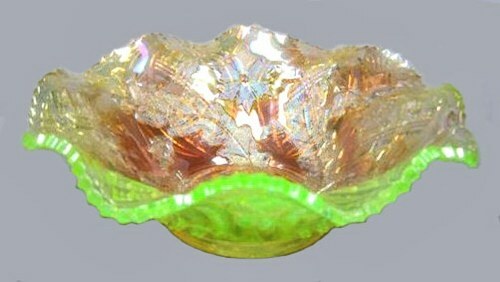 The late Frank M. Fenton believes that the radium finish, so prized by Millersburg Carnival glass collectors may be attributed to that “Bright Iridescence” technique. Many early Millersburg examples display a satin finish, which is quite attractive but not as brilliant as the radium finish. 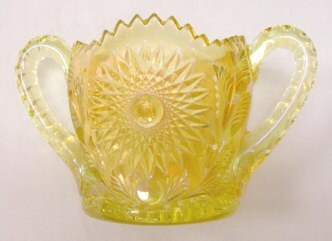 VASELINE is a name not applied to glass colors during the time of Millersburg manufacture. Uranium-containing compounds within the batch, was known by various names, such as canary, yellow, topaz, and yellow-green. 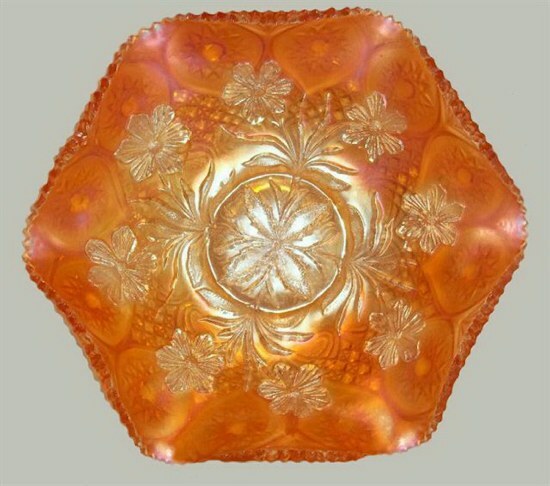 Not until 1938, when a Fenton Art Glass Company catalog used the term Vaseline, did the name become generally popular among glass collectors on into the 1950s. Millersburg Vaseline has a definite yellowish-greenish tint and will “glow” significantly under black light. 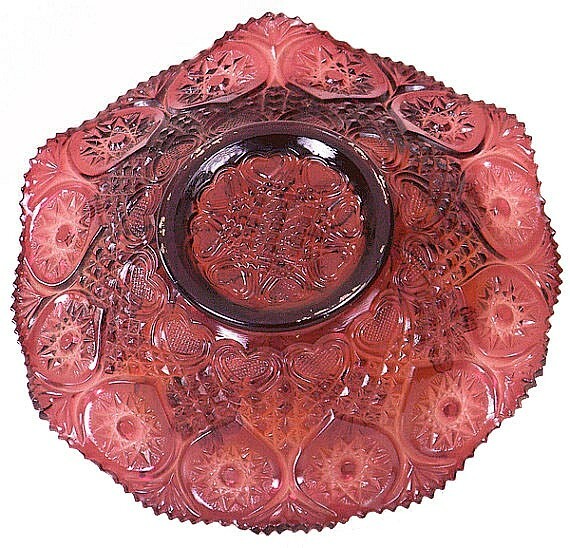 High cost of production may have been the reason so few examples are known to have been produced during the short time of Millersburg glassmaking. Vaseline glassware can be identified in using an ultraviolet light (black light). Note: Books written specifically on “Vaseline glass” do not mention anything about Millersburg glass of this type! Left - HOBSTAR & FEATHER Spooner- Electric Green. One sold in 1994. Right - HOBSTAR & FEATHER Spooner - Vaseline - Courtesy Aaron Hurst. Purple HOBSTAR & Feather Butter Dish - Courtesy Aaron Hurst. 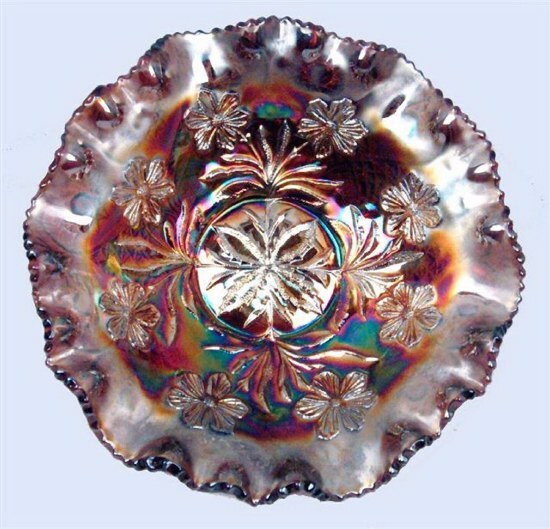 HOBSTAR and FEATHER: This is a carry-over pattern from the crystal period dating to 1909 and one of the first patterns to be iridized. Complete table sets in any given color are virtually unheard of. There may only be one electric green spooner. Two Vaseline spooners have been reported. 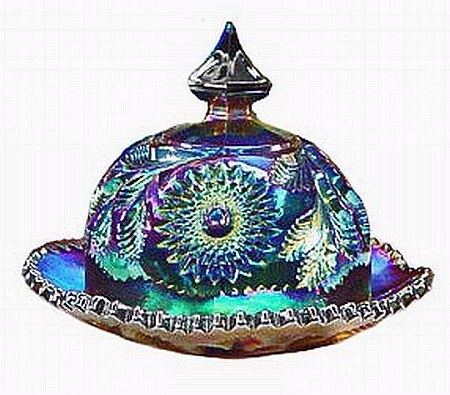 Butterdish, covered sugar bowl and spooner are known in amethyst carnival. 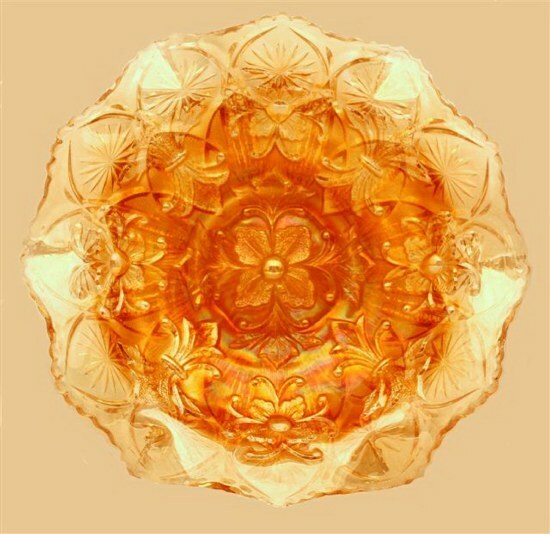 We believe the crystal compote with the 6” marigold top represents an early “experimental” application of color to the clear glass called LUSTRED ware. 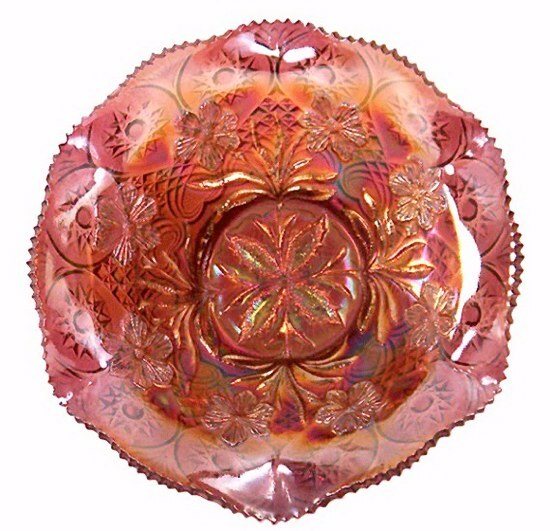 Hobstar and Feather was one of the first patterns available in either crystal or “allover fired golden iridescent finish”. A Dec. 1909 Butler Brothers catalog displays the punch set in either crystal or carnival finish. PRIMROSE Satin - with Fine Cut HEARTS exterior. PRIMROSE Radium - Courtesy Jerry & Carol Curtis. PRIMROSE bowl: Our Millersburg - Part 7 segment displays a lovely Primrose bowl having a satin finish. We provide viewers with another comparison study in supplying this second bowl in satin finish, so that you can ideally compare the radium finish example provided by Jerry and Carol Curtis, illustrating the highly “polished” finish which distinguishes it from the Satin finish. FINE CUT HEARTS - Exterior of Primrose. 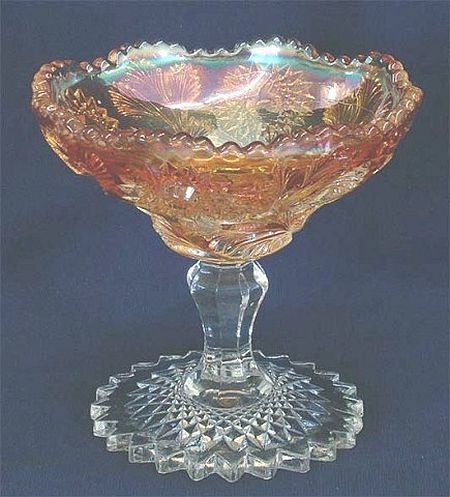 FINE CUT HEARTS: This 10” bowl in crystal was shown in a 1910 Butler Brothers Catalog, described as “full finished crystal.” It creates a lovely exterior pattern for iridescent Primrose bowls! Vaseline WHIRLING LEAVES sold for $4700. 10-10 Wroda Auctions. WHIRLING LEAVES - Tri-Corner in Green. WHIRLING LEAVES: Best known colors: amethyst, green and marigold. Three blue examples and four in Vaseline have been counted (according to Marie McGee). 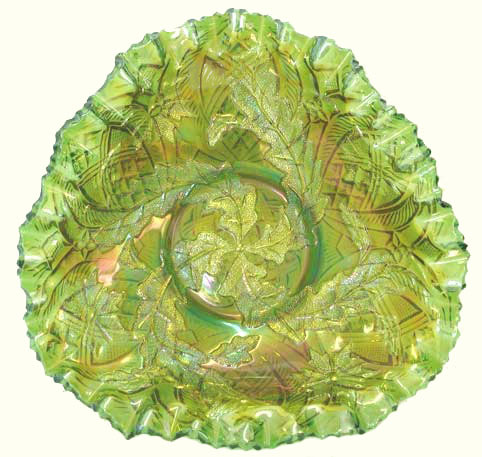 9” – 10” bowls in ice cream shape, six-ruffled, crimped edges, square, tri-corner, a deep round berry bowl and the rare diamond shape are known in this pattern.